Sure. ‘Tis the season, after all. 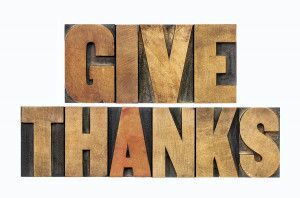 And of the many things we’re thankful for in the sales world during this week of Thanksgiving, we’ve decided to focus our gratitude on sales objections. That’s right, without them we wouldn’t have the opportunity to learn more about our customers' thoughts and needs. Objections actually set the table for meaningful conversations that aid you in becoming the trusted advisor your customer has always wanted. It’s not much of a secret that salespeople have a tendency to fear objections. The fear can be so strong it can keep you from doing your job—asking for the business. Customer objections are, however, not such a bad thing if you know how to handle them properly. Objections give you valuable information. They can tell you what is most important to your customer, and they can tell you specifically where your company’s solution has failed to meet a need. The flipside is that objections can also be an indicator that you didn't spend enough time identifying your customer's needs to be able to present a solution that clearly met those needs. If you have spent the time and done the research necessary to accurately determine needs, and if you have constructed solutions based on those needs, then your customer should have no problem seeing the value of your solution; in other words, you should have no fear of asking for the business at this point. The objections you should expect to hear then should pertain to secondary issues, like the logistics of implementing your solution. And yes, you should expect objections. Experienced salespeople know to be leery of customers who don't object. Alarms and flashing red lights should go off if your customer offers no objection to even your best solutions. It could mean they are not the real decision-maker, don't have the purchasing power to afford your offer, or are simply "kicking the tires." So, do us a favor as you spend time with the family and stuff yourself silly this week…be thankful for the little challenges, as sometimes those have the biggest impact. To learn more about handling sales objections and other sales tactics we're thankful for, take a look at the subject matter in our public workshop offerings - you can reserve a spot now for a workshop next year!